This post may make you feel differently about me, but I have to come out and say it – I l.o.v.e. 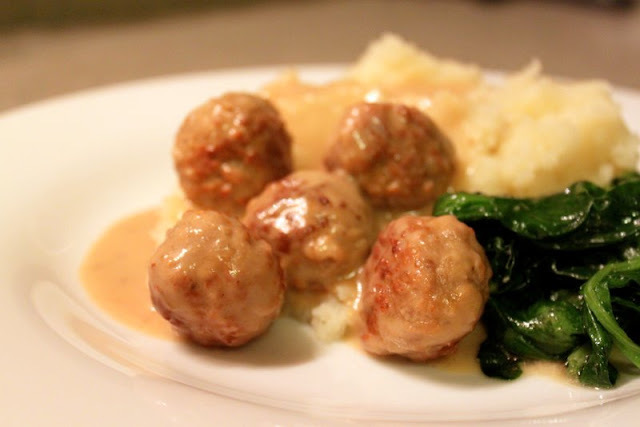 IKEA Swedish meatballs. Yes, I love IKEA, but the meatballs really put the experience over the edge for me. I decided I wanted to try to recreate the IKEA meatballs experience at home and I think I came pretty darn close! The gravy is out of this world, so that is what I really tried to focus on with this recipe. If you think meatballs and gravy for dinner is totally weird you can stop reading right now (I won’t be offended), but if you love these savory little meatballs like I do, I highly suggest you try this recipe! Drizzle a little olive oil into your saute pan and set on medium heat. Saute frozen meatballs for 7-9 minutes. You want to brown the outside of the meatballs. Once outside of meatballs are browned, remove from pan and set aside. Next add butter and flour to saute pan. Cook flour for 2-3 minutes. Then whisk in 3/4 of a box of beef stock into your pan. Scrape up all the brown bits from the bottom of your saute pan. Whisk to incorporate all of the flour and butter mixture into the stock. Add 1/2 cup heavy cream and salt and pepper, to taste. Turn up heat to medium-high. Bring gravy to boil and reduce to a simmer. Cook for 10 minutes or until gravy reaches desired consistency. While gravy is cooking, microwave (I know, totally strange) your meatballs so they are cooked through. Do this according to package directions. Once meatballs are cooked, return them to the saute pan and coat with gravy. 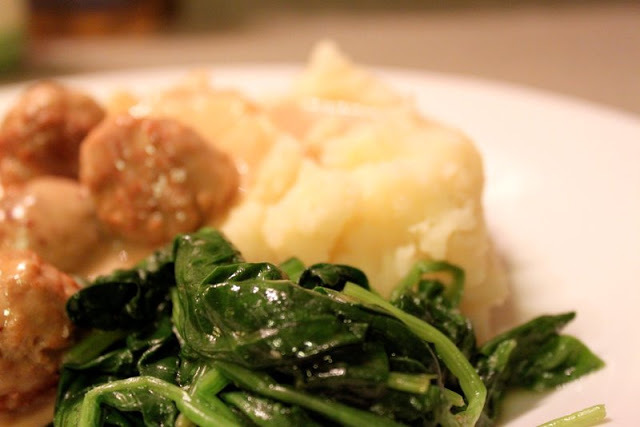 Serve meatballs with mashed potatoes (make sure to put gravy on those too!) and sauteed garlic spinach. If you really want to be like IKEA add a little cranberry sauce (they use lingonberry sauce, but I’m not sure where you find that). This is a stick-to-your-ribs kind of meal that shouts comfort food. I LOVE the Ikea meatballs and sometimes go over there just for lunch! Back in the day they used to serve them with boiled new potatoes which I love even more than the meatballs. Yum! Will definitely be trying out your recipe. I know nothing about ikea or the food they serve; however, I love swedish meatballs. While growing up, my Mom made them all the time. This recipe looks good. My Mom’s recipe calls for 1/2 cup of sourcream. Oh My Gosh! I LOVE Ikea food. I thought I was the only one! There is just something about eating instore. Maybe it has to do with childhood memories of eating lunch at the little cafe that was in our local KMart with my mom? thank you so much for this recipe! I, too, love Ikea and their meatballs! The lingonberries can be bought at Ikea, by the way. I’ll be trying this dish! 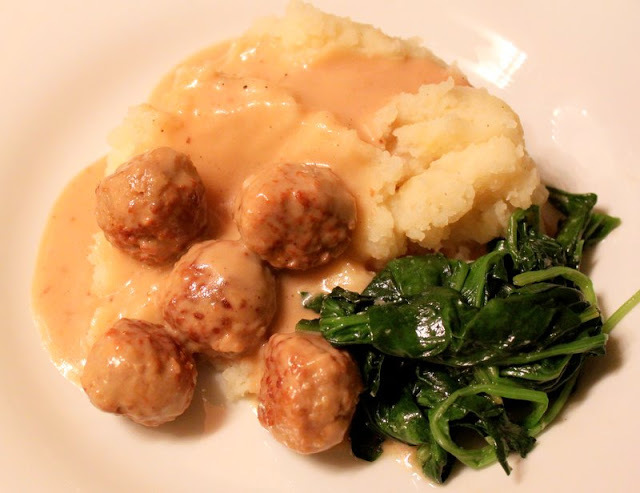 LOVE (addicted really…crave ’em in the middle of the cold winter nights) ikea Meatballs! Great, now I wanna go to Ikea! Will try your recipe! I just made these Sat Night and they were great. The baby had 2 helpings and had a great time trying to say “Swedish Meatball”. Highly recommend this easy recipe! I can’t wait to try this recipe this weekend. I love Ikea Meatball. I also go there sometimes just for lunch. Ikea is very near to my house. Only 3.5km away. 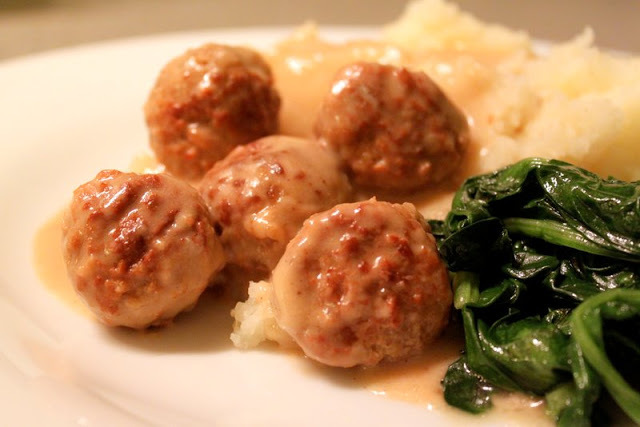 Great recipe and the Lingonberry sauce I know you can buy from IKEA, you may know that. I’m not sure if that can be ordered online from them or not but, most of your larger grocery stores will have imported products now and you can find the Lingonberry jam there. Some might even carry that in their regular jelly/jam aisle too. All you really need to do is heat the jam until it is melted and then use that for your sauce. This is definitely a knock off recipe! I love the recipe! The meatballs and the sauce looks so delicious. Just found this on pinterest this morning. Looks yummy I’m going to make this for supper. What size box of beef broth are you talking about, I’ll guess the meatballs quantity. We do not have trader joes where I live. What size box of beef stock and bag of meatballs? Both items vary widely in sizes, which makes a huge difference in this recipe!